“EH-EH” is the no-no sound. “EH,” singular, is the good sound. Both are really loud and obvious. 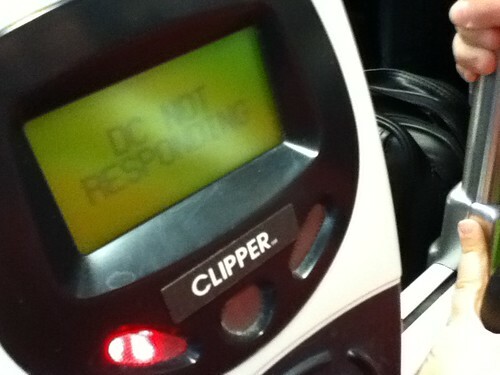 Those machines always tell you, aurally and on the screen, when your tag worked. Pretty sure it displays a red light if it didn’t. It happens to the best of us. 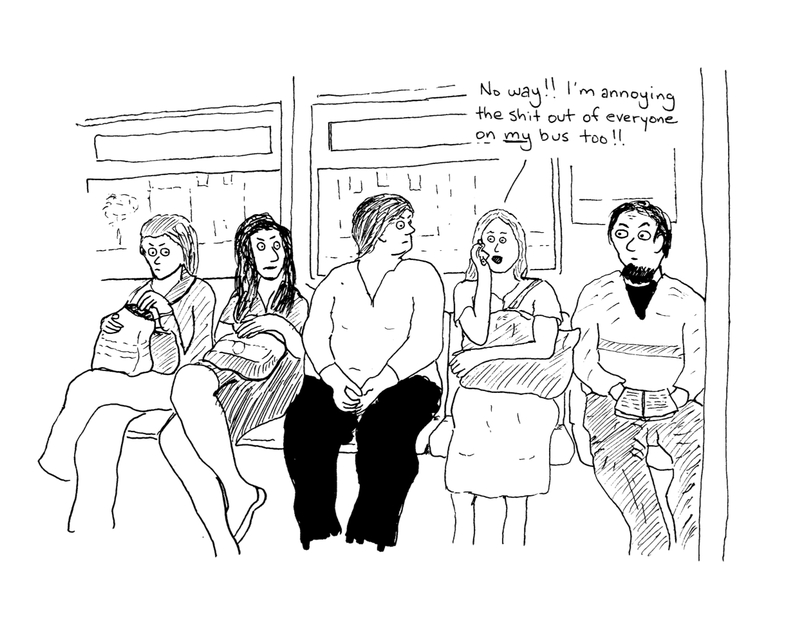 I usually board the bus, rolling my eyes after two tries, and tag at the back doors. The drivers can be faulted for a great many things, but failure to tag a card on persnickety machines isn’t one of them. She was sweet as pie to the passengers, perhaps realizing how snatchy the whole exchange was. 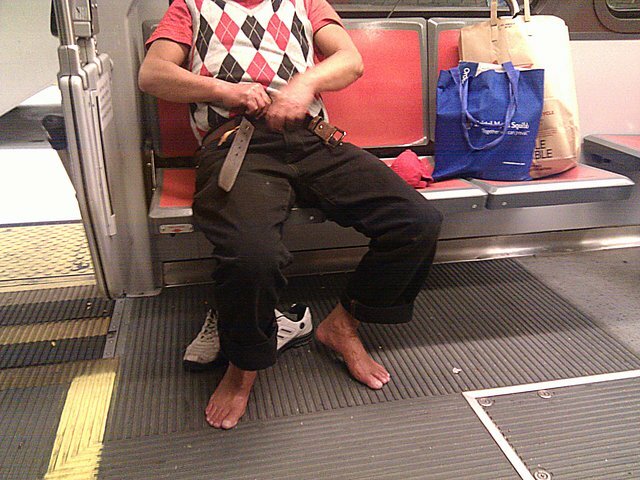 On Twitter, @sunghu reports seeing a Muni passenger who took comfort to the next level. 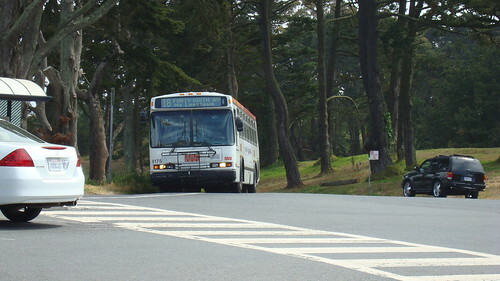 Greg at N-Judah Chronicles shares a story about a neighborly ride he had on the 18-46th Avenue the other day. Seems a fellow passenger decided he’d be their English tutor. 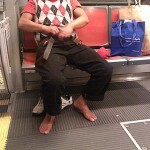 Read the full story at N-Judah Chronicles. Wouldn’t it be great if we were always so kind and helpful to one another? Via Questionable Skills, Ted McCagg brings us his hilarious illustration. 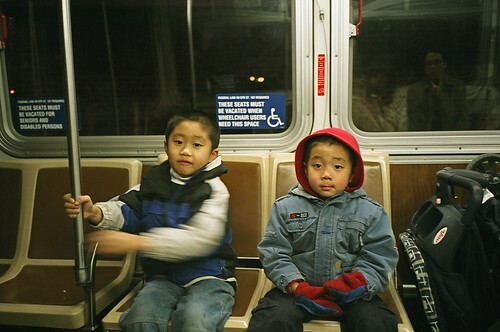 We’ve seen an uptick in tweets complaining about excessive and excessively loud phone talkers on Muni lately. What gives? 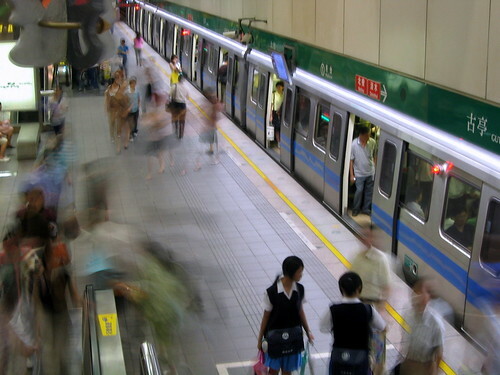 A little holiday traveling to Taipei reminded me that, just like there are unspoken rules in gyms, there are unspoken rules on public transit all over the world. For example, when riding the subway in Taipei, you’ll see that nobody sits in the reserved seats no matter how crowded or empty the train is. And if those seats are taken, everyone seems to offer up their seats when an elderly person gets onboard. Everyone seems to stand on the right side of the escalator even though the city’s transit authority had stopped encouraging standing on right hand side some time ago. I saw a sign encouraging riders to hold on tight to the escalator handrails: “The handrails have been sanitized regularly.” Hmm. – Watch your backpack so you don’t hit people in the face. – Step down to exit and yell “Backdoor!” for the uninitiated. Etiquette Inbox: Front seats for riders with kids? Should small children get dibs on the front seats? And if so, how do they fit into the hierarchy? For instance, do they trump a fairly spry 70-year-old? If we know you, you’ve got an opinion on this. Weigh in, please, by all means.